Community Tennis Associations (CTAs) provide the underlying support for all tennis programs in a community. Dedicated volunteers and professionals in CTAs raise funds, promote programs, and publicize local tennis activities to ensure that tennis maintains strong roots in the communities. Most importantly, CTAs ensure that every program is accessible to everyone. Guidance, grants, and technical assistance are available from USTA Southern and our nine state offices. 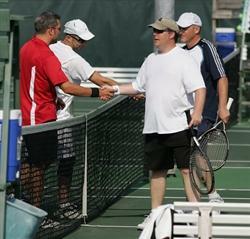 The Community Award applications are now available online at www.usta.com/cta. Be an active USTA CTA. To become a USTA Organization Member, click here for more information or call (800) 990-8782 and speak to a Member Services Representative. A USTA Community Tennis Association (CTA) is "any incorporated, geographically defined, not-for-profit, volunteer-based tennis organization that supports or provides programs which promote and develop the growth of tennis." In an effort to better understand the needs of community tennis associations nationwide, the USTA has an online registration system that allows each CTA to officially register and identify itself with the United States Tennis Association. The USTA Master Liability and Accident Insurance Program for Community Tennis Associations. Qualified CTAs can benefit from professional, high quality Liability and Accident insurance. CTAs can now operate freely with Liability and Accident insurance coverage being provided under a Master-policy program and a dedicated service center to guide you through the process. Click here for more information. The CTA Health Check provides a self-evaluation tool to measure the overall health and success of your CTA. Completing this Health Check will help your CTA leadership design a plan to strengthen your organization and have a broader impact on your local community, which may create opportunities to increase local tennis participation for children and adults. Click here to download the CTA Health Check document.